Data Deluge: Work hard. Tell everyone everything you know. Close a deal with a handshake. Have fun! Work hard. Tell everyone everything you know. Close a deal with a handshake. Have fun! Harold Edgerton was a remarkable MIT professor. He used stroboscopes to make incredible high speed photographs, which even today are breathtaking. HERE is a complete digital collection of images, stories and biographical material about Edgerton. 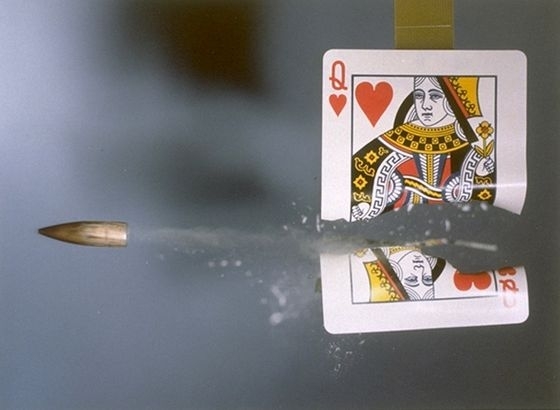 Queen of Hearts playing card hit by a .30 calibre bullet, 1970 © Harold & Esther Edgerton Foundation, 2002, courtesy of Palm Press, Inc. Example from Victoria & Albert Museum. To add clarity remove ink. Quality, is a probabilistic function of quantity. Go cry parp thy quantum. Scott Fitzgerald's Test of Intelligence.